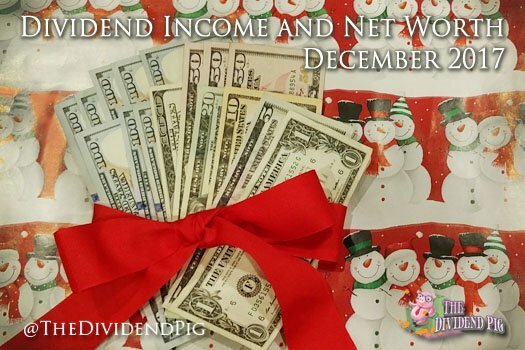 Another December report and another dividend income record set! This report is coming a little late as we had a family health scare and my thoughts have been consumed with more important things than money. We received a good report and the threat has somewhat abated for the time being. Thank God! One of the beautiful things about being a dividend growth investor is that you can take a few weeks from watching your investments without having to fear the sky is falling. I know my dividend stocks are still working hard for me and producing cash without any involvement from yours truly. Before writing this report, I hadn’t glanced at my holdings for a few weeks while I was busy with more important things. I do love dividend stocks. This month I received $1,086.74 in dividend income! On average, I was paid $24.15 from 45 different companies (really, 43 companies and 2 preferred shares funds)!! This month’s dividend income is a whopping 134.15% increase over December 2106. However, to put it into a much more modest perspective, it’s only a 5.73% increase compared to September 2017, my last big pay month. This is clearly some fantastic growth compared to last December!! Here is a chart of my passive dividend income progress over the last 3 years. The dividend portfolio has been updated. This has been a remarkable year and my dividend income has seen some pretty impressive growth! The key to this year’s success was my 401k changing to a program that allowed me to make my own investments. This allowed me to really ramp up my dividend stock purchases. This year I received a total of $5,758.37 in dividend income! This is a gigantic increase of 105.3% over 2016 total income of $2,804.02. I remarkably doubled my 2016 total dividend income this year! Not a small feat. However, I do want to be clear, this was only made possible because I was able to invest a little over $185,000 this year. The yearly dividend income total was not raised because I made some magical investments. It’s because I added A LOT of capital this year. I’m finally beginning to bring my cash reserves back up after a few months of decline. We’ll need this cash as we’ll have some new doctor bills coming up. I can see why people make such a big deal about healthcare, it’s crazy expensive. I’m thankful that I have the cash available to spend on doctor and hospital bills and don’t have to stress about how to pay medical costs. That extra level of financial stress would be very tough to manage during difficult health times. After some slightly rocky negotiations, rental property #1 will be sold in January. The sale proceeds will show in the January report and rental property #2 will become our only investment property. Rental property #1 was netting us roughly $450 a month while it was rented. It’s sad to see it go, but the proceeds will be used to clear our primary home mortgage. The great news is that eliminating our mortgage will free up almost two thousand dollars a month that we can use to invest! That’s a trade I’m happy to make. It has been a heck of a month and year. Dividend income is really starting to roll in now and I have crossed the one million net worth threshold. I’m extremely grateful for the successes I’ve had in 2017. But more importantly, I’m happy for my family’s health and happiness. Without those things, money adds very little joy. My ultimate goal is to retire early and live off the cash flow generated from my dividend portfolio and rental propertie(s). However, that goal means nothing without having my family with me to share in that accomplishment. I’ll continue to work hard this year and find the best dividend stocks I can. However, good values are becoming increasingly hard to find while this big bull market continues to roar. I hope we’ll see a solid correction soon so we can all find some decent values and put our cash to work. How did you do this month? Did you also set a new monthly dividend income record? Pretty awesome dividend income you got in Dec and 2017 overall. What’s even better is joining the double comma club. Congrats! Thanks Tawcan! I’m really excited about the dividend income! It’s been a long road and I’m thrilled the totals are becoming more and more substantial. I’m thinking about revising my 2018 yearly goal to 10k in dividend income. It will be a stretch, but I think I can save and invest my way there. Thanks for dropping in and commenting! Terrific achievements, Blake. 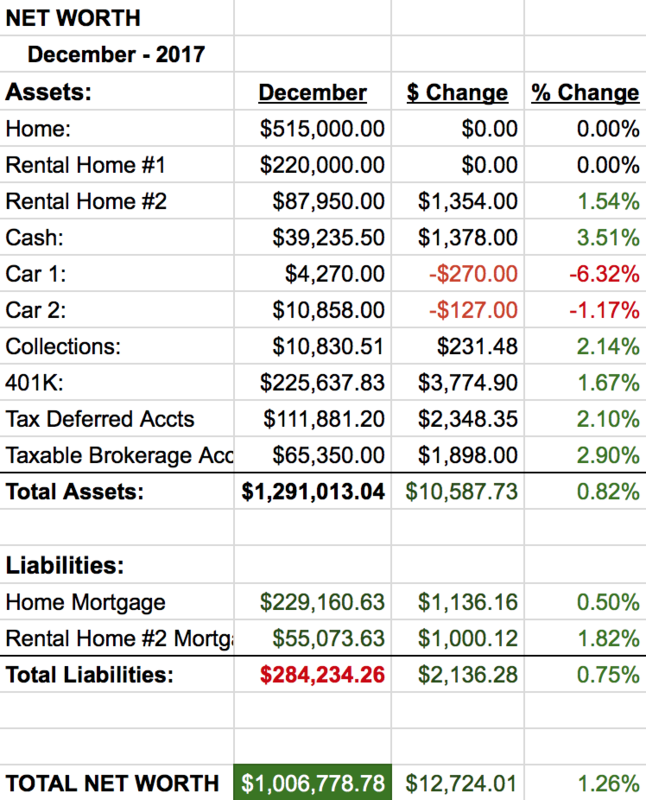 $1K for December, $1M net worth…. awesome. I really like the list of companies you’ve got in your portfolio. Keep building those positions and FI will be here sooner than you know it. Sorry to hear about the health scare… but thankfully it sounds like it may be behind you now. Thanks ED. Unfortunately, my wife will need another surgery (just 3 months after her last) 🙁 It’s been a rough year or so. On a happier note, at least the dividend portfolio is really starting to take off! I hope things are going well for you! Thanks for stopping by!